Rough sleepers from in and around Sheffield were served a three course Christmas dinner today (Wednesday 12 December) at South Yorkshire Fire & Rescue’s headquarters. The meal, which consisted of turkey and all the trimmings, was paid for by fire service staff and cooked by the service’s chef. Guests were then served a syrup sponge pudding. The attendees ate in the service’s café facility, which is shared with Age UK Sheffield, after being invited in by Framework’s Street Outreach team. The leftover food from the event has since been sent to the Salvation Army who will be using it to provide their beneficiaries with a Christmas dinner this evening. Area Manager Tony Carlin, who has led on getting the meal set up, said: “Working with our partners on the Weather Watch scheme has really brought home for us the issue of homelessness in Sheffield and we, with the support of our staff, wanted to give some rough sleepers at least one hot meal this Christmas. Members of staff based at the service’s headquarters donated £5 each to sponsor one meal for a rough sleeper – with any excess money going towards the Red Cross Weather Watch scheme. Following the event, the service has set up a JustGiving page – with all proceeds going towards Framework Housing Association. This can be found here. “We’ve had a lot of people asking us how they can help, so we’ve set up a JustGiving page as part of this event. This means that anybody who wants to contribute can do so by donating a sum of their choice, however big or small,” added Tony. If you’re worried about someone sleeping rough please call Framework on 0800 066 5358 or Text SOTS to 80800 followed by your message, or visit www.streetlink.org.uk. Electrical safety quiz – how safe are you? How safe are you when it comes to electrics in your home? How safe are your pets? As part of our Protect Your Pets campaign we’ve designed the below quiz to see how much you know about electrical fire safety. Have a go for your chance to win one of a great prize collection – including tickets to Yorkshire Wildlife Park, tickets to the Grenoside Pantomime Group’s Aladdin performance and a portable bluetooth speaker worth £35. We will draw the prize winners on Wednesday 19 December. If you’ve won, we’ll be in touch. This form collects some personal information - which will be used to contact the randomly selected quiz winner and subsequently be destroyed. By submitting the form you are agreeing for your data to be used in this way. Again, all of the above! Up to eight people will be able to stay overnight at South Yorkshire Fire & Rescue’s (SYFR) Headquarters, on Eyre Street in Sheffield, this winter – with British Red Cross volunteers on hand to welcome them. This is thanks to a partnership between various agencies – including Sheffield City Council, British Red Cross, Framework and South Yorkshire Police – and comes into action when the council activates its Severe Weather Emergency Protocol when the weather gets very cold. Known locally as Weather Watch, the scheme offers somewhere safe and warm for rough sleepers. Area Manager Tony Carlin said: “Helping people in need and saving lives is core to our mission as a fire service, so it makes perfect sense for us to provide emergency accommodation during particularly severe weather periods. When Weather Watch kicks in, SYFR will be opening the doors at ‘Central Headquarters’ on the coldest nights at 9pm and places are allocated by contacting Sheffield City Council on the numbers above or by calling into First Point at Howden House. Staff at HQ will link people up to the Council’s Out of Hours Service when places are full, so that warmth and shelter can be found elsewhere. For more information about help for rough sleepers visit www.sheffield.gov.uk or www.helpushelp.uk. Stop putting your animals at risk – that’s the message from firefighters, and a number of special guests, as they launch a new safety campaign aiming to drive down electrical fires across South Yorkshire. Figures released by South Yorkshire Fire & Rescue today, to coincide with Black Friday, show there have been more than 350 electrical house fires in the county over the last three years. Data also shows that crews have attended over 76 house fires in the last three years where pets were involved – highlighting that it isn’t just humans who can be affected by fire. With most of these incidents being described by fire officers as easily preventable – the service has joined forces with a number of local ‘celebs’ to produce a series of online videos that highlight some of the everyday electrical fire risks in the home. Sheffield Lord Mayor Magid Magid joins Pete McKee, Radio Sheffield’s Sam Cleasby and her husband, and former Arctic Monkeys tour manager, Timm Cleasby, in the series – with the first of which being launched today on social media. 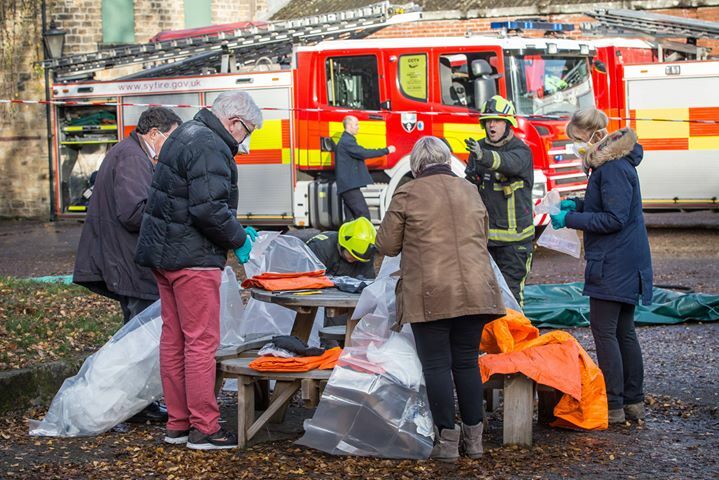 The launch of these videos will also be followed by a range of stalls and educational talks across the county – with people across South Yorkshire urged to act on the three pieces of advice being given out by the fire service. Area Manager Steve Helps, head of the joint police and fire community safety department, said: “When you leave the house in a morning, with the washing machine on and various electrical devices on charge, do you ever think about how your dog, or maybe your rabbit, would escape in the event of a fire? How about your fish, or budgie? “Anybody who has a pet knows that they are part of the family but they are often overlooked when it comes to escaping in an emergency – with fire as a prime example. We know people are busy and don’t want to ask too much, so we’ve pulled out three simple things that people can do to keep their animal friends safer. “Most of our electrical fires could have been easily prevented and the most common causes are things like leaving electrical appliances (like washing machines and tumble dryers) on overnight and when people are out, as well as overloading plug sockets. Don’t leave appliances on, and devices charging, at night and when you’re out of the house – to eliminate the risk of these malfunctioning and catching fire. Buy electrical equipment which is genuine and from trusted sources – ‘knock off’ phone chargers and batteries are prone to setting on fire. Don’t overload plug sockets – exceeding the advised current rating (13 amps) can cause them to overheat and catch fire. Earlier this month firefighters from Central and Lowedges were called to reports of a fire on Reney Road, Sheffield. Upon arrival they found a dog trapped inside a heavily smoke logged flat after a toaster had completely melted. A different incident, which took place a year ago on Princess Street, Doncaster, saw two dogs trapped in their smoke-filled house during a kitchen fire. They had a lucky escape that day but their owner, Shaleen Ross, said it could have been much worse. “When you leave the house you don’t think about what might happen when you’re out, especially to your pets,” she added. “Fortunately the dogs found an air pocket, they got lucky, but we still had to move out of the house for three months as they kitchen was destroyed and there was smoke damage to other areas of the house. It was six weeks before Christmas too. More recently, on Sunday 17 November, crews from Doncaster and Edlington attended a house fire on Anchorage Lane, in Sprotbrough, which was caused by a faulty washing machine that had been left on overnight. Following the fire, Watch Manager Gary Ridgeway, who was the incident commander on the night, has called for people to make sure washing machines, tumble dryers, dishwashers and other electrical appliances are switched off overnight. He said: “This incident started after the occupant got in at night and turned the washing machine on before he went to bed. There was a fault in the washing machine which started the fire, filled the kitchen with smoke and caused a significant amount of damage to the property. “This is a serious issue for us, though. People think that putting the washer on overnight will be cheaper and save time. It may do, in some cases, but you have to think about the risk and what could happen if there’s a fault and you’re not there to react quickly. South Yorkshire Fire & Rescue is thanking people across the county today (Monday 12 November) for their support during the bonfire period – with fireworks now being off general sale. Crews from across the county dealt with the same amount of overall incidents on bonfire night this year than last – but saw a 16 per cent reduction in the number of ‘secondary fires’ they were called to during the course of the evening. 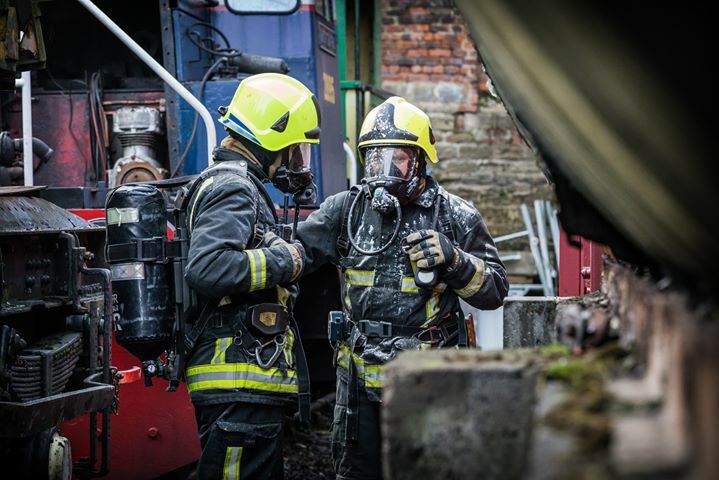 Preventing secondary fires, which include things such as deliberate rubbish and bin fires, as well as out of control bonfires, was a key focus of the service’s work during Operation Dark Nights. The joint annual initiative, which was launched last month in partnership with South Yorkshire Police, saw officers from both organisations visiting schools across the county to talk about a range of things including peer pressure, the dangers of playing with fire and misusing fireworks. It also saw parents urged to talk to their children about these dangers and the potential consequences of carelessness and deliberate fire-setting. The activity ran from mid-October until the week after Bonfire Night itself, to account for any late bonfire parties, and whilst officers welcome the reduction in secondary incidents in comparison to the previous year, they are still urging people to take extra care over the coming months. “A lot of work took place in the run up to bonfire night and I’d like to thank the public for their support, its pleasing to see that we’ve not seen an increase in incidents attended and have actually had a reduction in some areas, but it is important that we don’t become complacent,” said Area Manager Steve Helps, head of the joint police and fire community safety department. Speak to your kids and find out what they’re up to – remind them of the damage that fire-setting can do to both people and property. Bring your wheelie bins straight in after collection, and don’t leave them out overnight. These are often a target of arson. Businesses – don’t leave your rubbish and waste lying around! If you’re having a bonfire, make sure it is away from trees, bushes, sheds and fences. Take care with fireworks and never go back to one once it is lit. Fireworks (including sparklers) can only be bought from registered sellers, for private use, between 15 October and 10 November. They can also be bought between 26 to 31 December and 3 days before Diwali and Chinese New Year. Outside of these dates they can be purchased from licensed shops. South Yorkshire Fire & Rescue is once again calling on people across the county to take extra care today (Wednesday 7 November) and over the coming days as they celebrate Diwali. With many families coming together, to celebrate what is one of the biggest dates in the religious calendar, comes an added risk due to the increased use of candles, divas, tealights and fireworks. The cooking of special meals can also bring additional dangers. Always place divas/diyas, tea lights and candles on heat-resistant surfaces and well away from curtains and decorations. Children and pets should be supervised at all times near flames. Don’t let yourself get distracted – never leave cooking unattended. If a pan with oil in it catches fire, don’t move it and don’t throw water over it. Get out of the kitchen, close the door behind you and call 999. Ensure that all fireworks meet British safety standards and never go back to one once it is lit. “This is a really important time for so many people across South Yorkshire, and we’re really keen that everyone observes it and enjoys it safely,” said Area Manager Steve Helps.